Ever have the feeling you’re expending more energy and time avoiding a task instead of actually diving in and doing it? I get a lot done, but I am a master of putting things off. I have an email sitting in my inbox about an offer that I’m keep telling myself I will look into. Oh, it’s from February. 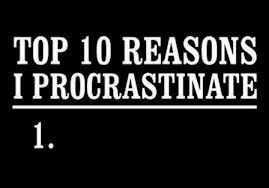 Procrastination is an ailment that debilitates salespeople. Not only does it create guilt and anxiety about not getting things done, it obviously pulls down sales results. Fear of failure, and/or of success, says Jane Burka, author of “Procrastination: Why You Do It; What to Do About It,” Regarding the fear of failure, she says that it’s more acceptable to believe you’ve failed to reach a goal by putting it off, than to believe you lacked the ability to reach it. Conversely, there’s the fear of success. Some salespeople put off prospecting, since they feel that by reaching and beating sales goals, they’ll be expected to exceed higher ones each month. They’d rather not face the new demands success can bring. Use power-blocking. Break your calling day into 45-minute, one-hour, or other segments that work for you. Take breaks in bet­ween. And do nothing during your power blocks but call. Don’t putz away time talking to other sales people. They won’t buy anything from you. Break huge tasks into manageable chunks. Opening an entire new territory could seem like a Goliath-sized task. But slicing it down into a series of bite-sized morsels makes the mountain easier to scale. Schedule unpleasant duties for your own “up time.” Those parts of the day when your energy level is the highest. It’s easy to procrastinate when vigor is dragging, so find easy, mundane tasks to do during those times. Don’t anticipate how prospects will respond. Often, procrastination is a result of saying, “Oh, this person won’t buy. I know they’re from someone else who is cheaper than us. They wouldn’t be interested, I won’t call them.” Most successful reps realize that by simply calling instead, they’re pleasantly surprised. Schedule a specific time for tasks you’d usually rather avoid. For example, setting aside Wednesday morning as Prospecting Morning can provide the impetus to dive right in. Don’t let unpleasant jobs age and pile up. Just like rotten food, the longer it sets, the more foul it becomes, and the more you avoid it. Do these tasks the first thing in the morning. You’ll feel better knowing that you’ll quickly get them out of the way. Make tasks you avoid more pleasant. If you fear prospecting, learn more and better ways of doing it. You’ll boost your confidence, and won’t avoid it. Avoid procrastination, do it now, and you’ll watch your production skyrocket! Here are some DO IT NOW quotes for you. Art- I see this every day. Particularly, the “talking to other sales people.” You are right, they aren’t going to buy. Extended chit chat is definitely a waste of time. But sharing tips and strategies is a valuable. There are many things about working a sales job that are very exciting: talking to multiple people a day; finding that client that is a perfect fit for your solution; successfully battling objections. But the steps you have to take to get to these end objectives are often a lot less fun. Like the article mentions, it is not just that these tasks are not enjoyable, but they are actually uncomfortable to accomplish. Trying to build a new list of prospects can be hard – how do you know which ones to start with? Making a call to someone you think is going to hang up is nerve-wracking; no one wants to be shut down. But these are the tasks that are not only a necessary evil, but they are usually imperative to have success within a sales role. I always tell myself that running an effective sales process is about being uncomfortable. Asking those tough, direct closing questions; setting a pricing proposal you think your client will think is too high; putting in just one more call before closing a prospect, etc. As a general rule of thumb, the more uncomfortable it makes you, the more important it is to just do it. This helps me avoid procrastination because the sooner it’s done, the better.